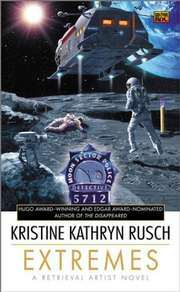 If you read any of the four genres in which Kristine Kathryn Rusch writes, chances are you've come across at least one of her books or stories at some point, especially given that Rusch has received top awards in all of her literary fields. In his Introduction to Rusch's collection Stories for an Enchanted Afternoon, Kevin J. Anderson recollects a time when he found himself "standing at a grocery store paperback rack ... and finding books by four of her different incarnations all in the same place." A writer as productive and wide-ranging as Rusch needs a roster of pen names to go with her torrent of output. Under the name Kris Nelscott, Rusch writes mystery novels and has received the Herodotus Award and the Ellery Queen Readers' Choice Award. 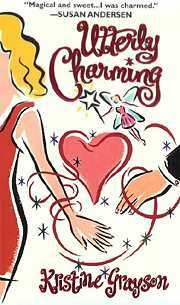 Her romance novel Utterly Charming, written under the pen name Kristine Grayson, took the Romantic Times Reviewers' Choice Award for Best Paranormal Romance. Under her own name, Rusch has written science fiction and fantasy works that have taken the gamut of prizes from the Hugo Award to the Homer Award and Readers' Choice Awards from both Asimov's and Science Fiction Age. As an editor, Rusch is no slouch either: she also took a Hugo for her work behind the scenes with other writers' projects. A decade as an editor saw Rusch's own output diminish, but now she is making up for it by writing four ongoing book series, each in a different genre -- this in addition to her many fine short stories, examples of which have been collected together in volumes such as Golden Gryphon's Stories for an Enchanted Afternoon and Five Star's The Retrieval Artist and Other Stories. It is Rusch's Retrieval Artist series that occupies her currently in the science fiction field. Last month saw the publication of Extremes, the follow-up to the first book in the series, The Disappeared. (The short story, "The Retrieval Artist," though set after the two novels, started Rusch off on the series.) Rusch also writes media tie-ins (Star Trek novels, original books based on the TV series Roswell), often sharing these jobs with her husband Dean Wesley Smith. As impressive as all this might be, it's still mere fact. Let us take a moment to look more closely at the extraordinary thing that is Rusch's fiction. Rusch has a way of working her way into an idea, exploring it, taking it to a place of definition -- a place where other writers might be content to arrive at an ending and call it quits -- and then going beyond that point of definition. Way beyond. Take her short story "Coolhunting" as an example. Rusch takes aim at contemporary culture's five-minute attention span by amplifying the public appetite for fresh fashion to the point that the cutting edge look or style -- that which is "cool" -- has a shelf life measured in days or hours. To achieve maximum benefit of association with the newest and coolest trends, companies make use of "cool hunters" -- bounty hunters who track down the very next rage in looks and dress sense. The heroine of the piece is a highly successful, quite wealthy, and irrepressible peripatetic young woman whose nomadic life has not slowed down since she left home years before. What Rusch does with impeccable finesse is place her heroine at the crossroads between her art, which relies on constant cultural seismic activity, and her family, where a certain stagnation has held sway for decades ... but with the consequence that enormous pressures are building up, leading to an upheaval both inevitable and shattering. Many writers of speculative fiction content themselves with the speculation side of the equation -- the "coolhuinting" part of the story process. Few take the time or access the creative juices Rusch makes her stock in trade to tell the rest of the story, the fictional world where characters do not simply fight aliens, or save the universe, or die violent, dramatic deaths; Rusch follows her characters home, in story after story, and finds, in their families and frustrations, the most truly alien settings of all: the places where they live. Kristine Kathryn Rusch corresponded recently with infinity plus about the universe of her work and the many worlds that exist within it. Kilian Melloy: You often write from the perspective of male protagonists, such as your Retrieval Artist, Miles Flint. What draws you to male (as opposed to female) viewpoints? Do you find it a challenge to adopt a male tone and perspective? Kristine Kathryn Rusch: Actually, I write from both male and female viewpoints. 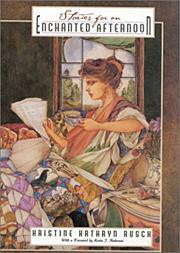 A lot of my short stories, especially the mysteries, are from female points of view. I never really think of which POV will be better -- I just go with the character as my brain conceives it. Which is a backwards way of answering your last question. I find male points of view no more difficult than female. I think we're all the same under the skin, so writing from different perspectives becomes easier. The hard part is figuring out where a character's life experiences differ from mine -- and what kind of impact that would have on the person to make them different from me. KM: In your Retrieval Artist stories, one basic tenet is that the Moon has been colonized for some centuries. With NASA perpetually shrinking and even the International Space Station being cut down so drastically from its initial building plans, do you envision human colonies being established in reality at some future date? KKR: Yes, by private enterprise. The culture's already moving in that direction. KM: There is some fear that humanity is on the verge of missing a closing window of opportunity to become a truly space faring civilization. Wealth and resources are being diverted from manned space initiatives, and with resources dwindling and the global population rising, it seems much easier to envision a low-tech future of grinding poverty and social dysfunction for much of humanity than to credit interstellar communities and starships. What's your take on this? Is there hope for the future, or are the doomsayers looking more likely to be right about things to come? KM: Getting back to The Retrieval Artist: In these stories, you envision humanity as enmeshed in complicated legal agreements with alien races that sometimes put human beings in grave peril. I cannot help thinking about One-World alarmists whose hackles spring up at the very idea of the United Nations. Was this a deliberate parallel? Are you in some sense playing devil's advocate and commenting on the risks of any nation relinquishing its sovereignty to too great a degree? KKR: I love the idea of the United Nations and hated seeing Bush eviscerate it, taking it back to Cold War status. Actually, even though it's really not in the books yet, the impetus for the horrible legal agreements came from business and corporate interests -- money, in other words. Let's make these agreements and to hell with the consequences. So... I'm afraid my liberal leanings are behind the outline of this world. KM: Miles Flint first appeared in the short story "The Retrieval Artist." In the story, Flint is more experienced than he is in the book series so far. Are you writing toward the short story, or will the original short story lie outside the chronology for the book series? KKR: I'm writing toward the short story. KM: Might you at some point write other Retrieval Artist short stories? KKR: I do plan more short stories. I simply haven't gotten to them yet. KM: And might those stories one day be collected into their own book? KM: Already in the first two books of The Retrieval Artist series, you've presented two very different sorts of stories -- and two different takes on why people might want to "disappear." Do you have ideas already for further books and different approaches to the idea of Retrieval Artists? KKR: As I wrote the first short story, I made a list of all the various reasons a person would disappear. The list kept growing as I kept writing, and I realized how big that universe really is. That's when I decided to write the novels. And I decided to write them like mystery novels, starting with the origin story. A few sf reviewers have complained about the fact that I have written a "prequel," which I have not. I wish more reviewers would read outside the sf genre, so they would understand that I'm working in 2 conventions, not just one. And in mystery, it's always best to know how a character got into his profession. The other mystery convention I'm using is that the novels do not have to be read in order. Unlike fantasy/sf series, the Retrieval Artist novels stand alone. They're richer when read together, but no one has to. KM: Your facility with the mystery genre shows in Extremes, where a murder has taken place. Is it difficult to fuse the two genres, sci-fi and mystery writing? KKR: Yes and no. I usually fuse two genres. My romance novels (published as Kristine Grayson) are really fantasy novels with romance in them. We just happened to sell them to romance. But they have a huge fantasy content -- Greek myths come to life, lots of magic, etc. If you look at most of my fiction, you'll see the tendency to fuse. And usually it's mystery or sf with something else. When I do mystery combined with sf, it's easy -- if I'm staying in the here and now. But if I'm worldbuilding, it's tough. What makes mystery work is seeing the out of the ordinary in the normal environment. We, as residents of this environment, know when something odd has taken place. In mystery/sf, I have to explain the normal, then the unusual, and then explain the impact. And if I'm not careful, I'll put in lots of expository lumps. The key, for me, is avoiding those lumps and getting the reader into the world as quickly as possible... which is harder than it sounds. KM: Extremes is set at a Marathon on the Moon, which is a brilliant idea. How did you work out the challenges and methods of a sporting event in a vacuum with one-sixth Earth normal gravity? KKR: I have had this idea for about 10 years. So I ask all sorts of odd questions to my scientist friends over time. It took a lot of working and reworking and re-reworking before I could figure out how the marathon would work. I had lots of help -- and the errors really are mine because I don't have a scientific mind. But everyone I worked with really was enthusiastic and helped a lot. KM: A few weeks ago I was volunteering at the Boston Marathon and I kept thinking of Extremes, because you have obviously participated in Marathons before to be able to describe the behind-the-scenes pandemonium so precisely. In what capacity have you participated? Was it solely in order to research Extremes? KKR: My husband has participated in marathons. I don't have the discipline. Because of him, I've been at a number of sporting events in all sorts of odd capacities. The marathons happened before I met him, but I did do other races with him. I've also done century rides on my bicycle, and the background there is much the same. But I have run off and on for years. And each time I went out, I thought about the Moon Marathon. Now that the book is done, unfortunately, I can't get up the urge to run. So I walk. Maybe there'll be a walking book some day. KM: You seem to have an equal mastery over police procedures and the way detectives think. How have you come by such expertise in the details of criminal investigation? KKR: Lots of places. I was a reporter. I worked as a secretary for a forensic psychologist, so I spent a lot of time with the police. I'm fascinated by the science of police forensics, so I've studied it for nearly 20 years. And I read books like the history of fingerprinting. Seriously. KM: How did you set about formulating the Interstellar Law that Miles Flint's clients (or is "quarry" a better word for the Disappeared?) find themselves, sometimes inadvertently, breaking? KKR: That is a mixture of our law and the way law developed over time in western society. I'm fascinated by the ways cultures cross on Earth, so I figure when we meet aliens, it'll be even more complicated. I have a lot of lawyer friends (I don't know why), and my husband went to law school, so we all have a lot of discussions (read: arguments) over how the future laws will work. The system came from those discussions, and my knowledge of legal history. KM: The idea behind Retrieval Artists in itself is rather nebulous and difficult to define. How did you come up with it -- and how did you manage to define it clearly enough to turn it into a story and two (so far) novels? KKR: I was reading a novel about the Witness Protection program and I wondered how that might apply to sf. And from that, I somehow came up with Disappearance Services and Retrieval Artists. I'm not sure how the cross came, but it did come from the Witness Protection Program somehow. KM: So far, your Retrieval Artist stories have taken place on the Moon. Any thoughts about taking Miles Flint, et. al., to Earth, to interstellar space, or even to the home world of one or more of the alien species you've introduced? KKR: You've anticipated the book I'm currently working on. :-) In a word, yes. Oh, yes. Many different places. That's why he has a ship now. KM: Will the aliens from the first book -- the Wygnin, the Rev, the Disty -- be back in future stories? KM: I have this notion that when a writer has a series of books going, she has lots of plot notions written down on index cards for possible use. Is this true of your Retrieval Artist series? How many books would you guess you might write for the series? KKR: I have no idea how many books will come from this idea. A lot. And if the novels don't continue for whatever reason (probably book sales -- so buy lots, RA fans! ), I'll still do the short stories. This world is too big, and too much fun to abandon. KM: Many writers, when envisioning the far future, make the universes in which their stories take place either dismal and depleted (resources gone, humanity backslid into savagery) or else superficially bright but deprived in less obvious ways (freedoms stripped away, despots secular and/or religious holding sway). But you have crafted a future world that takes a middle course -- and seems not terribly different from our own. Was this a choice you made from a philosophy or conviction about how life will be/ought to be? Is it a way of telescoping our present day into a more universal time frame? After all, people are people, and one might expect they always will be. KKR: I recently read that each individual touches at least 100 years of human history -- and sometimes 150 years. The author of that book postulated that your parents memories and your grandparents' memories have as much of an impact on you as the books you read and the movies you see. They're not quite your memories, but you learn from them. My grandmother was born in 1891. I will, if I live as long as she did, carry her memories for 102 years. So I might be telling someone her stories in 2062. If you think about that, and the fact that human longevity is expanding, then you realize that a few hundred years in the future isn't that long. Even a few hundred years in the past isn't that long. You could sit down and have a discussion with Thomas Jefferson. You speak (roughly) the same English, you have many of the same touchstones -- the Bible, for example -- and English history to 1770. Since he influenced a lot of our culture, you would be able to talk with him about his beliefs. It would startle you where he differs from us (he held two conflicting notions about slavery his entire life), just like it would startle you to live in Miles Flint's universe. But human beings are human beings. We really haven't changed a lot in 500 years. We bathe more -- at least in the West. (But the Japanese have always bathed, so there you go.) We live longer. We eat better. But we feel the same emotions, have the same passions; we're blind and bigoted and difficult; we're intelligent and outspoken and far-reaching. And those are the reasons my future isn't black or white but shades of gray. KM: There are a couple of other stories -- "Alien Influences" and "Dancers Like Children" -- that grew into your novel Alien Influences. What is the process for a short story growing into a novel, or a series of novels? And how do you recognize the stories with potential to grow up into something bigger? KKR: Short stories are the source of most of my novels. Maybe all of them, actually. Not all short stories become novels, though. If I figure that I've explored all I can with a character/world/situation, then the short story stands alone. But often I write the story and make concurrent notes (like I described above) and I know that I have a novel. Sometimes I write a story, and my husband mentions that he wants to see more. Or, more often, he says, "You waved your hands and convinced us it's a short story. But it's really a novel. Write the novel." And I do. KM: Has your husband ever named "Strange Creatures" as a potential novel or series of novels? Because I for one was sad to reach the end of that story! KKR: Oh, I'm glad you like it! And yes, he did, and yes, I ignored him. But I kept writing about it, and finally, I have a lot of stuff set there. There are several stories in that world: "The Women of Whale Rock" (F&SF); "Strange Creatures"; and "The Light at Whale Cove." (Lighthouse Hauntings.) The first novel in that world -- with Hamilton Denne in a supporting role -- is Fantasy Life, which will appear from Pocket in November. KM: Another story I loved (though I don't know if it could be turned into a novel) was "Flowers," in your short fiction collection from Five Star, The Retrieval Artist and Other Stories, published last summer. KKR: Do you mean "Flowers and the Last Hurrah"? I have a hunch I'll revist that too, but not in a novel. I don't see enough there -- yet. KM: You write in your Introduction to Stories for an Enchanted Afternoon that the work you did as an editor made you a better writer of short fiction. What, as an editor, did you look for in a story? KKR: I looked for a good, memorable story. It had to affect me when I read it, and -- here's the key -- I had to be able to remember it one week later. KM: Do the things you look to accomplish as a writer easily meet the goals an editor (yourself or another) might have? KKR: I wish it were that simple! Now I write to please me. If I think of what an editor will want -- me or another -- I'll freeze. I have to be alone in my office, which means the only voice in my head has to be a creative one, not a critical one. So no editors allowed! <G> At least until the story is finished. KM: Do you tend to go back over your stories with an editor's eye? KKR: I am a reader first and foremost. I love to read more than anything. Reading is entertainment as well as life's blood for me. So I must write the way I read -- not knowing what comes next. Is that with an editor's eye? Only if you think of an editor as a "super" reader -- one with a lot more experience. Still, I know a lot of writers and editors who no longer read for enjoyment, and that's a mistake. Because you have to love the work to do the work well, I think. KM: Are there ways in which the creative process pits writers against editors? KKR: No. The creative process belongs to the writer. An editor can point out where a story doesn't work for that editor, and maybe the writer will agree. But usually, the editor can't tell the writer how to fix the story. Sometimes that's because the editor is not a writer; sometimes it's because the solution still exists only in the writer's head; and, in the case of some editors, the editor may want to turn the story into his or her kind of story (John Campbell was famous for this). It's up to the writer to say it's my story, and I'll write it the way I want to -- at the risk of never selling that story. You can never, ever do revisions just for the sake of a sale. Same with the writing. You must write what you love. KM: Often in your short stories, though the characters and plots are separate unto themselves, the stories seem to fit easily into a kind of continuum of vision for technology and future history. For example, it's not hard to imagine the civil war on the Moon described in "Echea" as fitting in with the history of Miles Flint's Armstrong City, or the apparently new use of small computer devices on the skin in "Coolhunting" as leading into the links and various tiny devices worn on the body described in your Retrieval Artist books. Is this a deliberate part of your world building? Are you, like some writers (Robert A. Heinlein, for example) creating a consistent universe in which to allow the bulk of your stories and novels to take place? KKR: Wow. You're one of the only people who has ever noticed that. It's not deliberate on my part. But sometimes I think of things that loosely fit into something else, and it allows me to focus on the story. And yes, "Echea"'s Moon history is part of Armstrong's history -- but here's where it breaks down: the Earths are different. I plan to write a novel in "Echea"'s universe some day, and it will be very different from the Retrieval Artist's. So yes, there are similarities, and no they're not always deliberate -- more me exploring themes. KM: Are there currently plans for another collection of your short fiction? KKR: Not at the moment. But there's always hope. I went for more than a decade without a collection at all. Then I had 3 in 2 years. So let's hope there won't be a ten-year gap between those and the next! KM: You're currently writing four series of books in as many genres. How on earth do you manage that level of prolificity (if that's even a word), not to mention the ability to write so much in so many genres? KKR: I have no life. Seriously, I love to write and I write quickly. (I was trained to meet deadlines when I was a journalist. That, combined with my typing speed, really means that I don't mind working for several hours every day. Most writers don't work that many hours, so they don't get as many pages.) But the key, really, is that I love to write. KM: You were saying that you often write books that fuse different genres, but even so do you have to sit down to write with a specific mind-set for each general genre -- one mood or way of looking at things when you're working on a romance versus another mind-set when it's a mystery or a science fiction book? KKR: I have to be careful with what I read when I'm writing. That might sound odd and unrelated to your question, but it's not. If I'm writing romance, I'm reading very heavy depressing stuff -- dark mysteries or suspense or horror. And if I'm writing mysteries (and my mystery novels are dark), I'm reading romance to balance the darkness. If I'm writing sf, I can't read sf, but I can read any other genre. Same with fantasy. KM: Your books have won awards in every genre in which you write. That's remarkable! Is there any specific attribute common to your work across genres that you think accounts for your critical and peer success? KKR: I read across the genres. I honestly did not know what a genre was until I was in college. Kevin J. Anderson told me about genres. Before that, I went into a bookstore and bought a book. I had no clue that other readers stayed in particular sections. I never did, and I don't as a writer either. A story is a story is a story to me, and while that gives me the ability to work in a variety of genres, it also makes my career difficult. I don't easily fit into one nitch (as my agent often reminds me <G>). KM: Are there genres you have not dipped into that you'd like to give a try? KKR: Western and mainstream, although I have sold short stories in both genres. KM: You and Dean Wesley Smith do a fair amount of franchise writing in addition to stories set in worlds of your own invention -- Star Trek novels, Roswell books. I was struck by the difference in the stories set in your own worlds versus those that are part of the Trek universe -- though your work for Pocket Books' Trek novels is top of the line for franchise writing, your non-franchise work seems fresher, more vibrant and inventive. Do you find franchise writing restrictive? KKR: Franchise writing is different from my own writing for obvious reasons. The world and characters are assigned. So all we can really work with is plot. I think if you remove character, voice, and world-building from my fiction, you're left with the least innovative part of my writing. KM: You and your husband team up for Star Trek fiction from time to time as well as writing Trek books independently. Together, you wrote the first original Enterprise novel. Did you have much to go on at the time you wrote the book? You have such a handle on the characters and the technology of their time that it seems as though you must have had more than the writers' guide to go by. KKR: We had the first 3 (I think) scripts, writers' guides, and the TV Guide article on the characters. We also had a long streaming video of all the commercials for Enterprise which had, as I remember, one bit of dialogue from Phlox and almost nothing from anyone else but Archer. It was quite a trick. I remember being unable to tell Trip and Mayweather apart for the longest time -- certainly not a problem that I have now! (In fact, Trip is now my favorite character on Enterprise.) But in the early scripts, their personalities hadn't come out yet. So we guessed. And fortunately we guessed right. They also hadn't cast Porthos yet, or they hadn't revealed what kind of dog he'd be. So I kept imagining a Great Dane or something (why else give him the stately name "Porthos"?) and he turned out to be this cute little thing. Shocked me when I saw the pilot! This is why tie-in writers don't do physical descriptions when we don't know. We could very easily be wrong. KKR: I like writing them all, actually. I have favorite characters to write, however. And my favorite series is Classic -Trek- with (surprisingly, to me) Enterprise second. KM: A fair amount of noise has been made recently over the "decline" of Star Trek, the box-office and critical failure of the most recent film, the disappointing ratings of Enterprise, and so on. What's your feeling here? Is Star Trek really waning or is this a period of fluctuation like ones that have happened before to the Trek franchise? KKR: Oh, I think it's all noise. The problem with the way movies are "scored" is that they always shoot beyond the high gross. And I think the Trek franchise works the way that episodes work. If fans love a movie, they'll see it several times. If they think the movie isn't as strong as a previous one, they won't see it as often. So it simply depends on whether or not the movie hits the fans in the right way. First Contact certainly did. Nemesis, I think, suffered from timing. I don't think Americans wanted to see anything dark in the year + after 9/11. Enterprise, on the other hand, has started better than any of the "new" series. The scripts are stronger and it has taken less time to find its feet. The problem is one of availability. I know of several markets in Oregon that don't have UPN. A lot of fans I know can't even watch the show because the local UPN affiliate's carrier signal doesn't reach them. I really like the direction that Enterprise is going now, and I hope they hang onto this plotline for a while. KM: TV Guide recently had a poll where they surveyed viewers as to how Enterprise could be "fixed." If you were to answer that poll, what would your advice be? KKR: I really don't think the show needs fixing. Every Trek show has had its detractors -- even the first show. The problem with our culture is that so many people now pay attention to the detractors that they don't listen to the folks who are the solid fan base. I love Enterprise. I think there've been some dull shows, and I think they've corrected that. But I'm a Buffy fan too, and there were some dull shows that I struggled through. Same with West Wing, and CSI, and every other show. The problem is that those shows don't have the multitude of fan outlets for complaint, developed over decades, like Trek does. I think people would miss Trek if it goes away. I know I would. KM: Okay, enough Star Trek questions! (I'm sure you must be thinking the same thing.) Let me ask you about your short fiction. In your Introduction to Stories for an Enchanted Afternoon, you observe that there is a common thread to that collection's stories -- they have to do with family, "home and hearth." This is true, but the homes are often rife with resentments and the hearth is sometimes rather cold. Considering all we hear about the disintegration of the family, one can't help but wonder if this recurrent theme of the fractious family is a science-fiction oriented critique of the things that threaten family in our age: the selfishness of the parents (as in "Coolhunting"), the ways in which women are still, in a sense, the property of their families (as paralleled by the experiences of the orphaned girl and the adoptive mother in "Echea"). KKR: I'm not quite sure what you're asking here, although the comment is interesting. Yes, the families aren't always pleasant, but if you look at sf, its main job is to critique and warn -- unlike, say, romance, whose main job is to celebrate and make the readers feel good; and mystery whose main job is to put order on chaos. People often do not like sf for the very reason you mentioned above: it isn't always pleasant -- and I've noticed that a lot in my most successful sf short stories. I try not to be too unpleasant in the novels -- why read them if they're no fun? -- but I figure you can get away with a lot more in short stories because of their length. KM: You made mention of your "liberal leanings" in an earlier reply, but upon reading "Monuments to the Dead," I couldn't help the feeling that you were skewering the "liberal" perspective a little bit -- acknowledging "liberal guilt," only to then acknowledge in turn that we live, more or less guiltlessly, on the backs of third world peasants thousands of miles away. I think you truly nailed this "liberal guilt" phenomenon by letting the main character of the story confess to boredom with the "miracle" she's investigating. Or have I got it all wrong? KKR: Such a 21st century question! <G> Seriously, it has become politically incorrect to speak ill of anyone, particularly someone with whom you identify. Therefore, conservatives can't criticize conservatives, and liberals can't criticize liberals without someone saying that they no longer belong to the group. I am liberal -- leaning toward radical in many instances -- with a heck of a political pedigree, now abandoned except in my writing. And yes, I nail liberal guilt in "Monuments" because it's something true liberals have to deal with: at what point do you cross over from believer to hypocrite? And where is the line? The main point of this story, though, isn't the liberal guilt, but the fact that the main character, although she is a paid observer, sees so poorly that she doesn't even realize who the people around her are. And the last image of the story shows that she might be getting her sight back. It's a heck of a failing among people, liberal or conservative, to fail to see the world around them. It's more subtle for liberals: conservatives often don't see the results of their (overall) actions. Liberals often do, but don't see the day to day. There's a story that Sam Donaldson tells about reporting on presidents that covers this: He said the differences between Ronald Reagan and Jimmy Carter were startling: Carter worked hard for the poor, weak and helpless in the administration, but would often leave his aides stranded without a car if Carter had to be somewhere; Reagan would give you the shirt off his back if you asked, but could care less about overall policies. I think that defines the difference between the liberal and the conservative sensibilities very well when applied to the broad spectrum and "Monuments" deals with the one-on-one blindness. KM: What are you working on now, and what will we be seeing in print from you under your various pen names in the near future? KKR: I just finished the latest Kristine Grayson (which is why this interview took me so long to finish) yesterday. It's called Absolutely Captivated, and continues the fantasy/romance saga of the Fates. I then turn my attention to the next Retrieval Artist book. I already mentioned Fantasy Life, above. There will be another stand-alone fantasy novel sometime next year (no title yet). And the next Smokey Dalton, Stone Cribs, has been delayed until February because St. Martins wants to tour me. The fifth and sixth Smokeys just sold, so I'll be working on that for some time. I just finished a spec novel -- we'll see what happens with that. And the next spec novel will be a Kris Nelscott, in San Francisco with a spin-off character from Smokey, also set in the late 1960s. I'm trying to do a short story a month -- and trying to send them to the magazines, rather than anthologies, like [I] have the past few years. We'll see how that goes. I have stories lined up at Hitchcock's, Queen, Asimov's and SciFi.com right now. Extremes was published in July 2003.
fiction by Kristine Kathryn Rusch - read an extract from the novelette Millennium Babies. features - more interviews and features by Kilian Melloy.